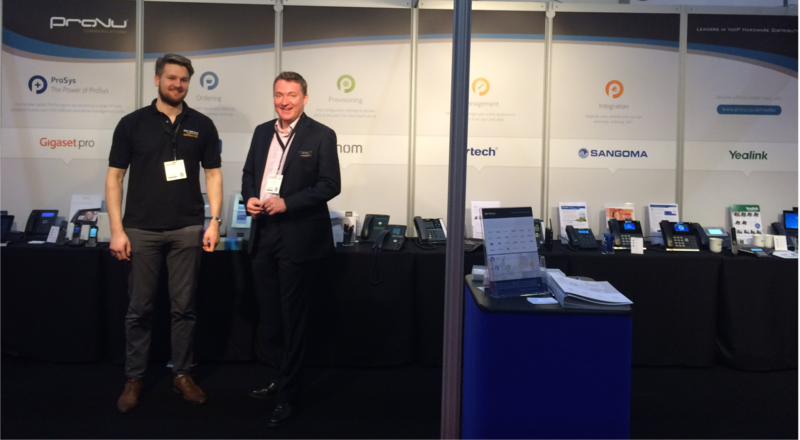 Join us on stand 74 at the Convergence Summit South on Tuesday 27th and/or Wednesday 28th September at any of the above times for a live provisioning demonstration with Sangoma’s new IP phone range and the PBXact UC Systems. When you install Sangoma IP phones, the Redirection Server points the phone to the PBXact UC System for effortless, automatic zero-touch configuration. See for yourself how easy it is to register Sangoma’s IP phones with the PBXact UC systems, plus discover how the range can be enhanced with the Sangoma Phone Apps. Interested in finding out more about the Sangoma range? Pop by stand 74 where we will have Sangoma’s very own Director of Product Management and Product Marketing, Simon Horton on hand to answer any questions you may have. Win the Ultimate Team Away Day with Gigaset pro! Gigaset will be joining us on stand 74 at the 2016 Convergence Summit South next week. 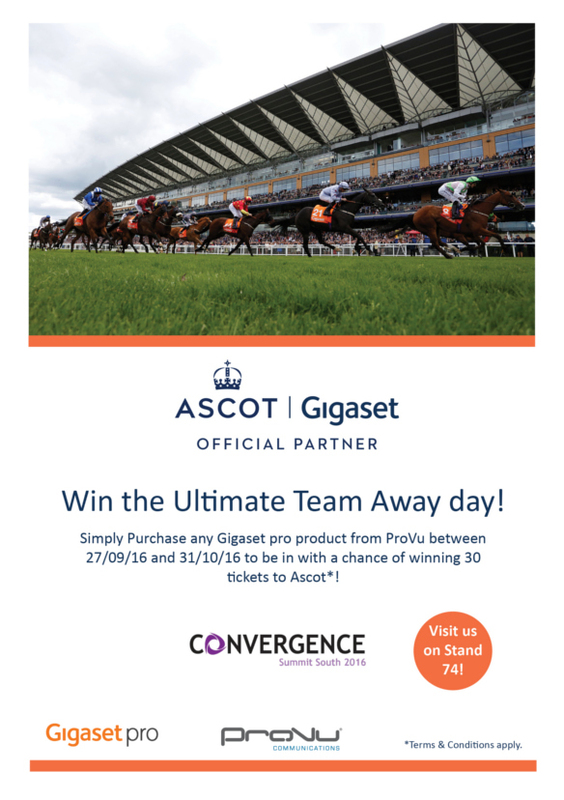 Exhibiting their latest product range and the new, soon to be launched Maxwell desk phones, Gigaset will also be offering you the chance to win the ultimate team away day with up to 30 tickets to Ascot up for grabs! Entering this competition couldn’t be easier, simply purchase any Gigaset pro product from ProVu between 27/09/2016 and 31/10/2016 to be in with a chance of winning*! *Terms and Conditions Apply: One entry per company, tickets available for selected 2016 & 2017 dates only, tickets do not include any food, drink or transport. The ProVu Team enjoyed a successful trip to the Convergence Summit North last week. It was great to catch up with our new and existing customers, we hope it was an enjoyable experience for all who attended! We would like to thank everyone who visited us on stand 47 and a special thank you to our vendor partners, 2N, Gigaset, Sangoma, Snom, VTech and Yealink for joining us. We look forward to the next Convergence Summit, taking place on 27th and 28th September in London. This year will mark our 3rd year of exhibiting at the Convergence Summit South, taking place at Sandown Park Racecourse on the 7th & 8th October. Joining us this year will be Sangoma, Snom, Gigaset and Yealink. The exhibition is free to attend and is a great opportunity to meet new and existing clients. Please register your attendance below and don’t forget to come and visit us at stand 73! Once again ProVu will be exhibiting at the Convergence Summit North and this time it is being held at the International Centre in Harrogate on 17th and 18th March. This is a great opportunity to come and meet the ProVu team and view the latest products from snom, Konftel, Gigaset and Sangoma. On display this year we will be featuring the exciting Gigaset Maxwell 10 tablet phone plus their latest cordless handsets. We will also have the very latest phone designs from snom with their D7 series. Sangoma will also be showcasing their new mini SBC which is designed for small companies and branch offices with call handling from 5 to 16 calls. And for the first time we will be joined by Konftel with their range of conference phones which support SIP. We will be located on stand 47 and we would love to meet as many of you as possible. All you need to do is register to attend at the link below. We look forward to meeting you at the show and if you have any queries or would like to arrange a meeting please drop us a line at contact@provu.co.uk. Another successful trip to London for the Convergence Summit South. It was great to meet some of our new and existing customers for the first time as well as catching up with those we have met before. Everyone’s stall was fantastic and we had a great time! A big thank you to everyone who came to see us at our stand, we’d also like to thank the vendors who were there to support us – Sangoma, Yealink, Gigaset, Snom and 2N. We look forward to the next one! The ProVu team will be exhibiting at this years Convergence Summit South on 8th & 9th October at Sandown Park Racecourse. This is our 2nd year of exhibiting at the show, and we find its a great vehicle for meeting and catching up with many of our existing resellers as well as new ones all under one roof. This year we will be displaying the latest IP phones and gateways from Gigaset, Sangoma, snom and Yealink. Pre Register Now to attend the show. We would love to see as many of you as possible so please do come and say hi, we will be located on stand 73. If you have any questions or would like to arrange a meeting please get in touch. Once again ProVu will be exhibiting at Convergence Summit North on 11th & 12th March at Manchester Central. We will be located on Stand 19, and will be showcasing products from our leading vendors including: Gigaset, Sangoma, snom and Yealink. This will be a great opportunity to come and see the latest phones and gateways and meet the ProVu sales team. If you would like to arrange a meeting with us during the event please e-mail your request to contact@provu.co.uk or call us on 01484 840048. ProVu will be exhibiting at the Convergence Summit South at Sandown Park, Surrey on Wednesday 2nd and Thursday 3rd October. We are located on Stand 76 and will be exhibiting the latest products from snom, Gigaset, Sangoma and Panasonic. The products include the new R630H ruggedised handset from Gigaset and the latest SBC from Sangoma. As well as the new 7 series phones from snom and the successful TGP500 from Panasonic. Attending the show will be Ian Godfrey and Jan Wdowczyk from Sales, plus our Technology Director Tim Bray and Managing Director Darren Garland. This will be a great opportunity to come and meet the ProVu team, view the latest products and learn more about our provisioning and fulfilment added value services.